Henneth Annun, Pt. 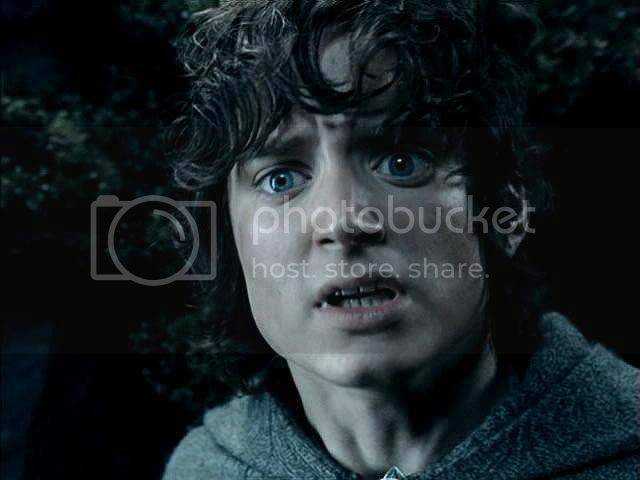 5: Frodo persuades Sméagol to come to him, who is captured by Faramir’s men. 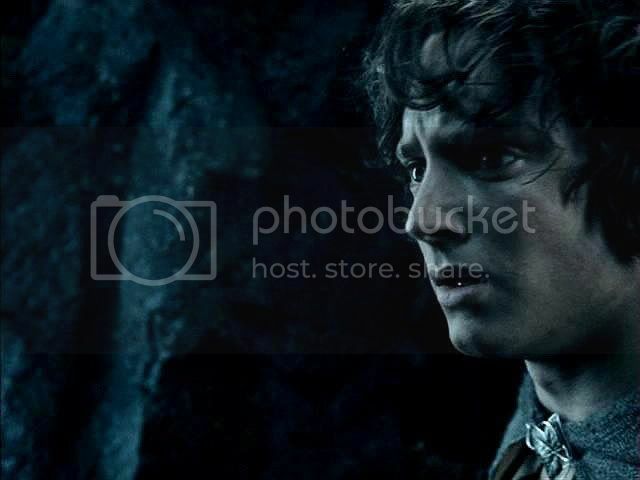 I think Frodo is excellent conveying his concern for Gollum’s welfare in this scene, but primarily after the deed is done. 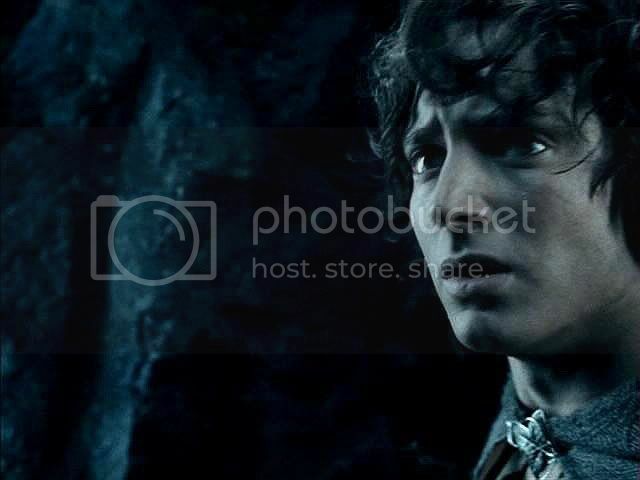 Calling Gollum to come, Frodo has kept his expressions mostly positive, a little exasperation peeking through, as he tries to convince his guide. But that all changes once Faramir’s men have bagged their quarry. 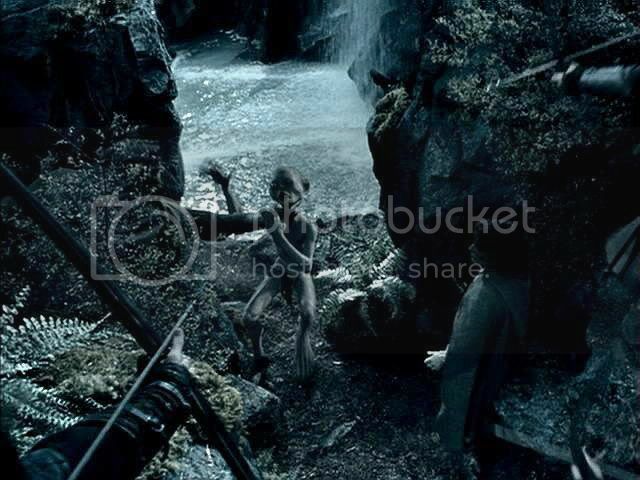 “Don’t hurt him!” he pleads as Gollum struggles and cries, a dark sack pushed over Gollum's head like a man going to his hanging. There is a sense of betrayal but also foreboding in Frodo's look as he observes Faramir watching it all from above, Faramir’s smile almost a smirk. 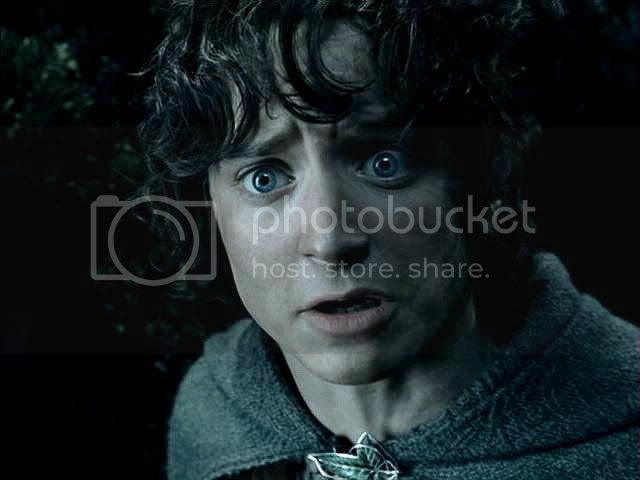 Frodo seems already to know he has made a bad bargain. 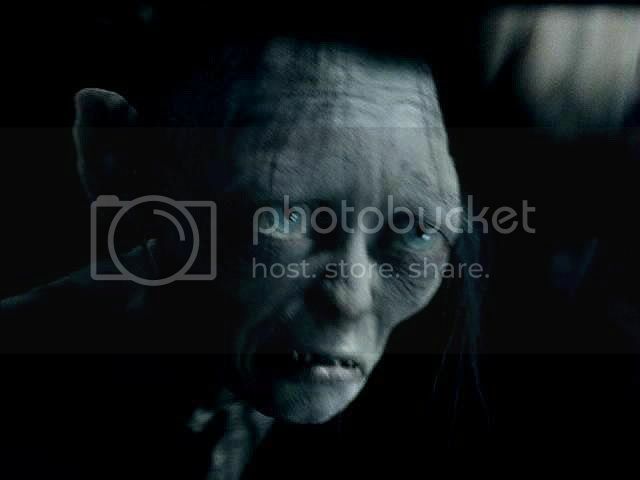 Not only has he betrayed Gollum into the hands of an enemy, he senses he may have betrayed himself as well. 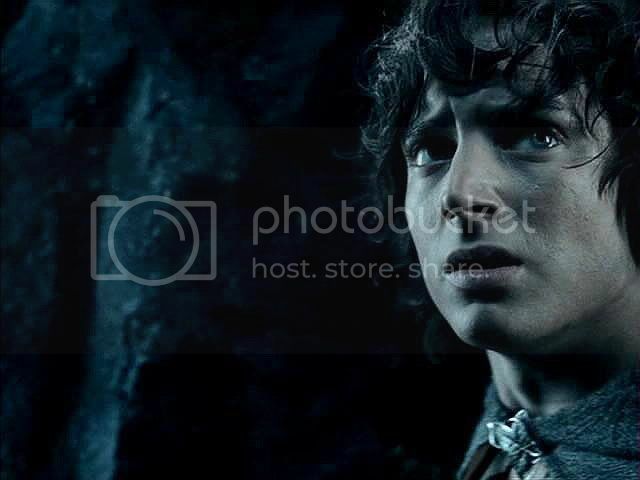 In the book, Frodo has every reason to believe that Faramir will be true and not make a lie of his promise to Gollum that he will not be harmed. 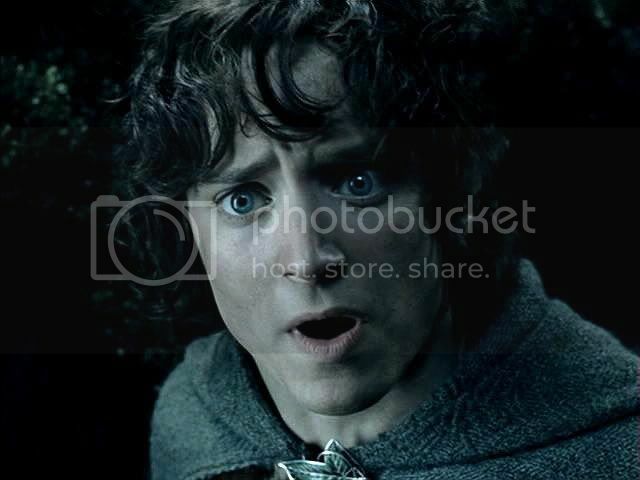 In the film, Frodo has no such assurance. In fact, the evidence points to the contrary. This Faramir will do what he wants. 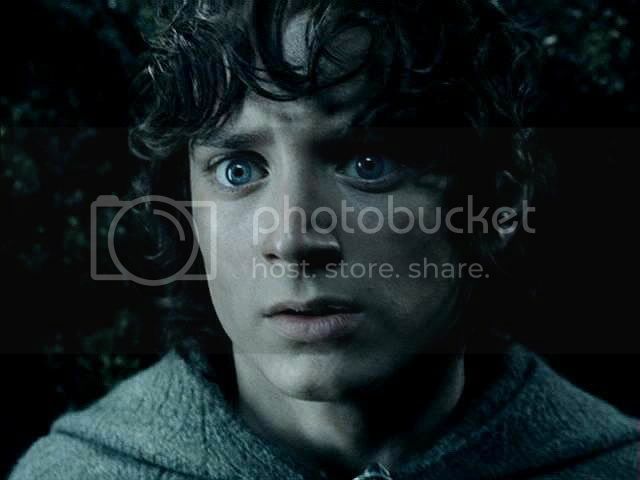 What Frodo might want appears to be of no matter. Gollum crawled along close to the brink for a little way, snuffling and suspicious. Presently he stopped and raised his head. ‘Something’s there!’ he said. ‘Not a hobbit.’ Suddenly he turned back. A green light flickered in his bulging eyes. ‘Masster, master!’ he hissed. ‘Wicked! Tricksy! False!’ He spat and stretched out his long arms with snapping fingers. At that moment the great black shape of Anborn loomed up behind him and came down on him…. He twisted round like lightning, all wet and slimy as he was, wriggling like an eel, biting and scratching like a cat. But two more men came up out of the shadows. Gollum went limp, and began to whine and weep. They tied him, none too gently. Gollum turned and spat at him. The men picked him up, put a hood over his eyes, and carried him off. 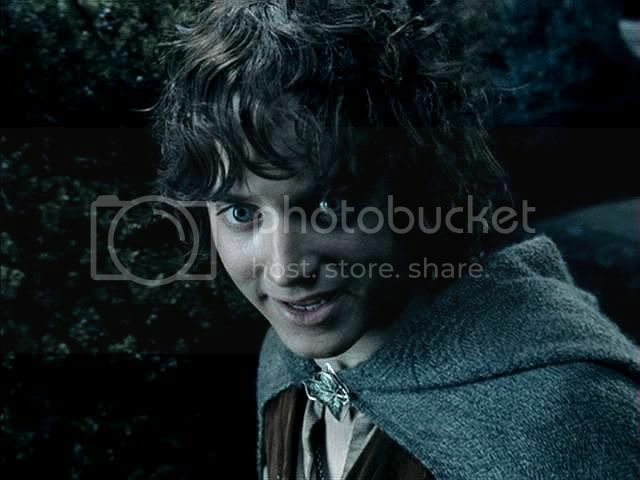 Frodo followed them, feeling very wretched. They went through the opening behind the bushes, and back, down the stairs and passages, into the cave. Two or three torches had been lit. Men were stirring. Sam was there, and he gave a queer look at the limp bundle that the men carried. 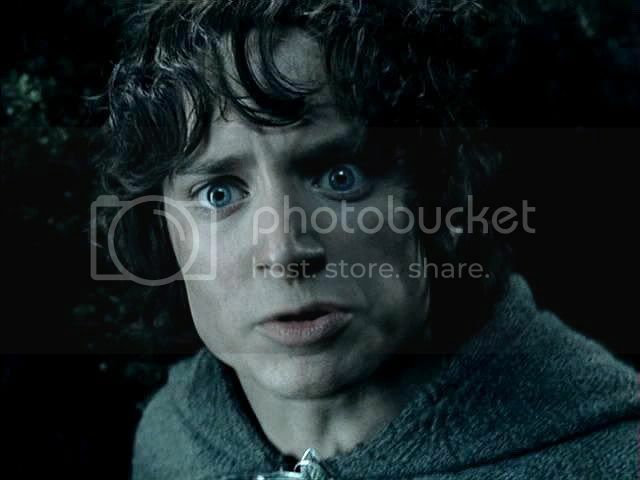 ‘Got him?’ he said to Frodo. 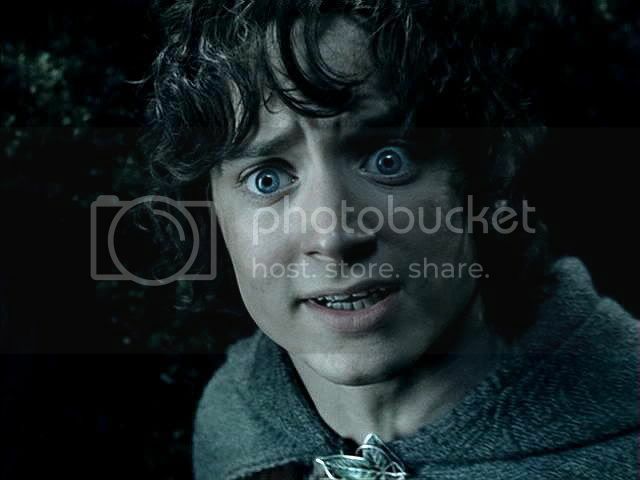 Film Scene: Frodo delivers Gollum into the hands of the Rangers. 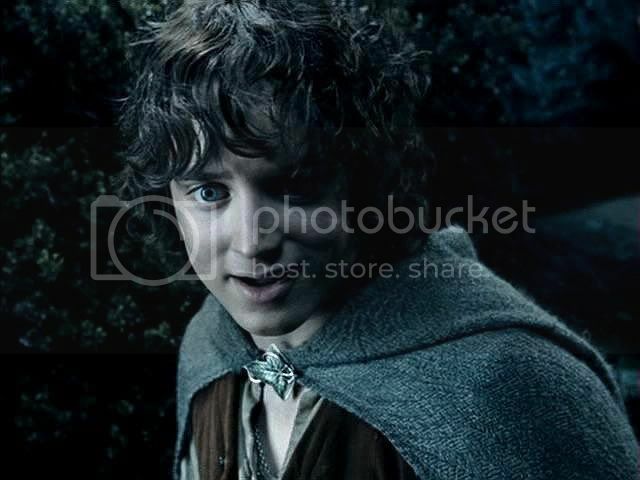 Frodo eases closer, holding out his hand and beckoning. Tentatively, Gollum comes to him. 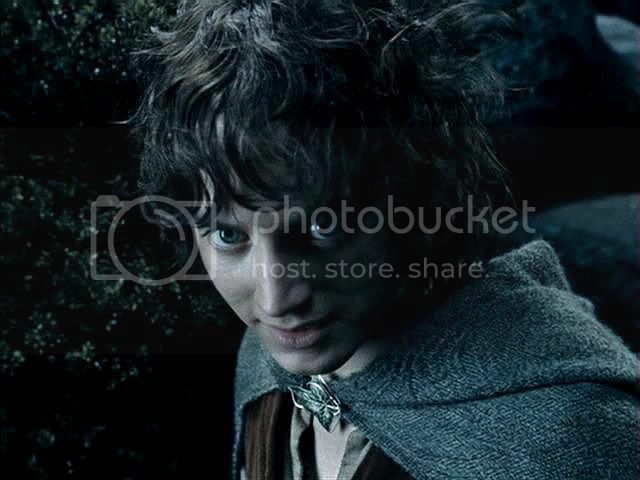 Frodo:: Come, Sméagol. Nice Sméagol. That’s it. Come on. 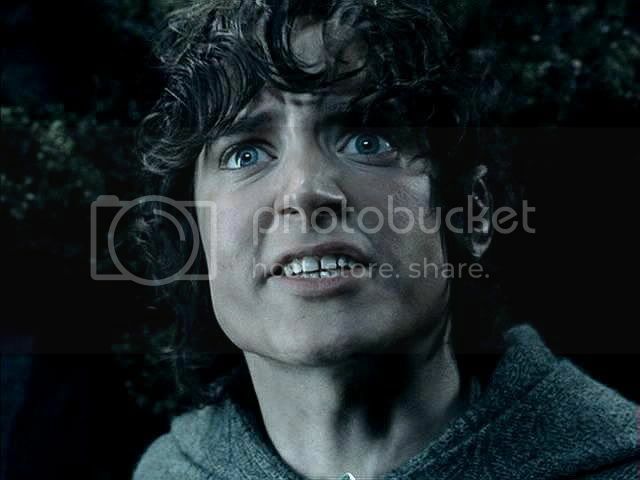 Frodo: Don’t hurt him! Sméagol, don’t struggle! Sméagol, listen to me! Faramir’s men shove a sack over Gollum’s head and he is carried off. 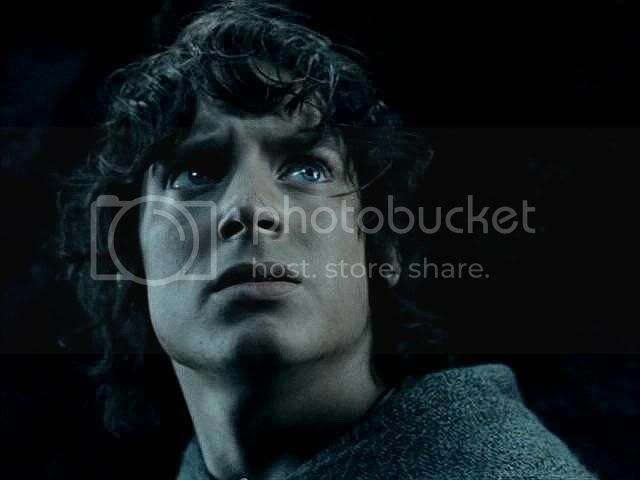 Frodo looks to where Faramir stands high above, wearing an enigmatic expression. If I were Faramir and had to look at Frodo's hurt and accusatory expression there, I'd feel soooooo guilty. Grrr! 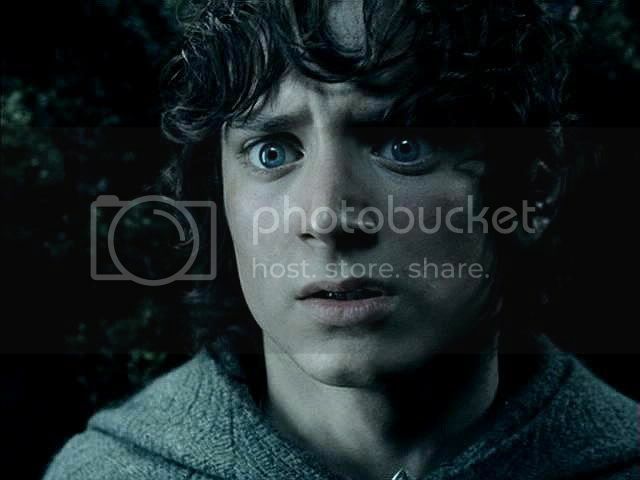 Wow, those were some expressions Frodo had! And the way he looks up at Faramir, I wonder how anyone could have betrayed him. Well, we wouldn't--but we love him! I hope you don't mind that I took two of your screencaps and merged them, Mechtild. Both realise their mistakes at the same moment; their correlating expression struck me. Wonderful screencaps and great comparison of book and film. Thank you so much for this! Oh, that is so COOL, Whiteling! Those are both such wonderful frames. It's great to see them together! This is another wonderful series of screencaps and commentaries, Mechtild. Although I love the film scenes in Ithlien and HA, I do miss book-Frodo's wisdom and book-Faramir's nobility. As you say, Faramir is redeemed in ROTK (I so admire David Wenham's portrayal). In the book these two characters form a firm bond of friendship and mutual trust, and it's such a shame that it was more or less lost in the films. While reading the book for the first time I anticipated their reunion in happier times, perhaps in Minas Tirith, but alas - Frodo chose not to record the meeting (which surely must have taken place) in the Red Book. 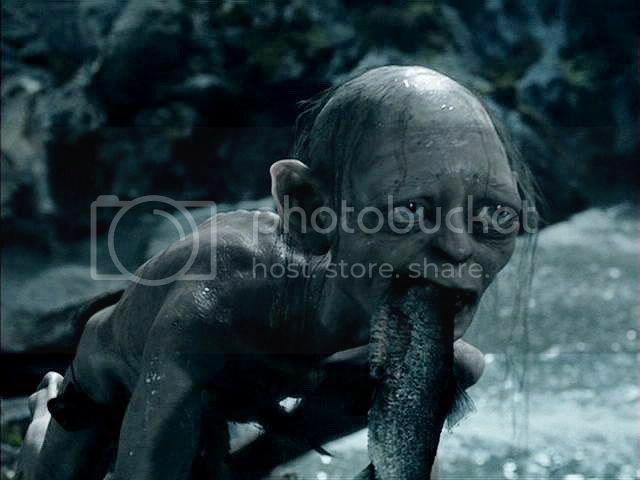 The ill-treatment of film-Gollum is also unsettling, I agree, though I never did sympathize much with book-Gollum. 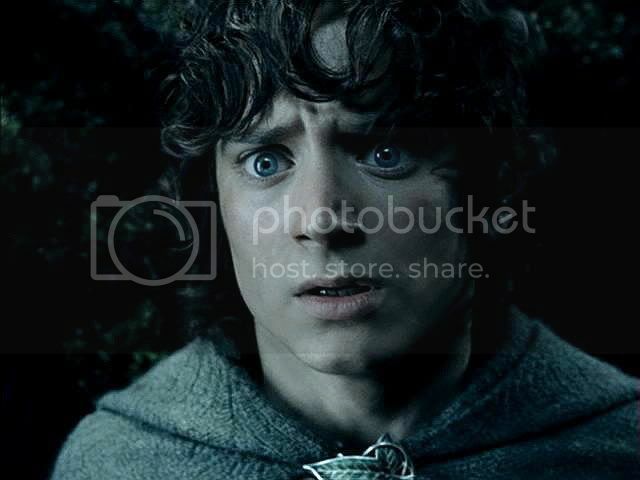 Frodo's sense of contrition is expressed beautifully in those last few frames. How wretched he must feel. 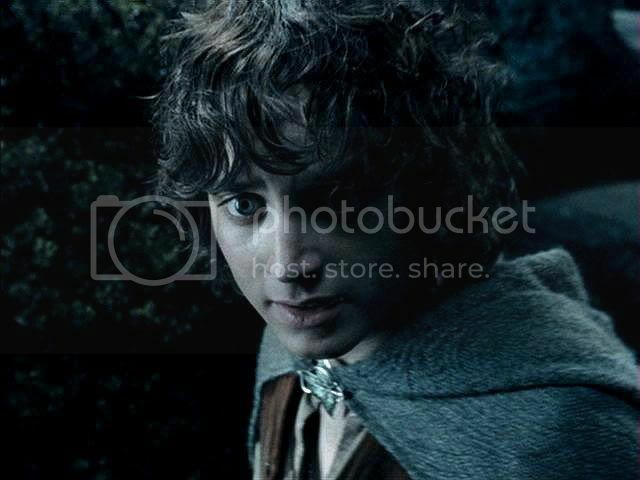 Frodo is gorgeous here, as always. Thanks so much for all the time and hard work you put into producing these engrossing entries, Mechtild. Thanks so much, Blossom. It's always good to hear what you have to say. I don't think book Gollum is NEARLY as sympathetic as film Gollum, although he seems loads wittier and smarter, but I think it serves the book that he isn't. 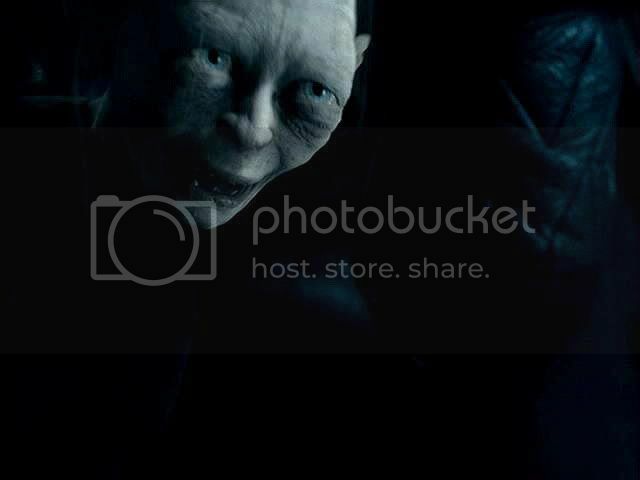 I think it highlights what mercy is precisely because Gollum is so undeserving. While reading the book for the first time I anticipated their reunion in happier times, perhaps in Minas Tirith, but alas - Frodo chose not to record the meeting (which surely must have taken place) in the Red Book. One of my favourite Minas Tirith post-quest fanfics is by Zazinka. Perhaps you know her; she was Flourish at K-D. 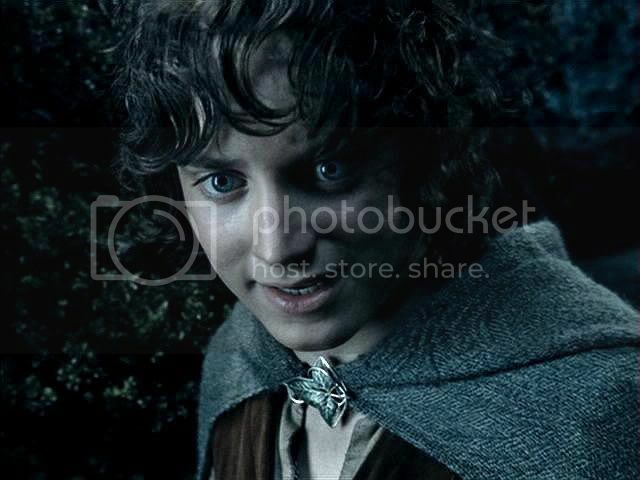 If you haven't read her little trio of post-quest Frodo stories, you are missing out on some very lovely writing: restrained and spare, well-observed, evocative, canon-faithful; never sentimentalized or mawkish. These really are "gap-filler" gems, Tolkienish without being slavish. Here is link listing her three stories at WotM. They are all short. The first story, "Beyond Hope", is set in Minas Tirith, portraying a quiet little reunion between Frodo and Faramir. I think it's quite beautiful. Yes Mechtild, I know Flourish quite well - we still correspond via e-mail regularly. I was fortunate enough to read her stories first-hand, as she kindly shared them with me before she submitted them to WOTM. I love them. As you say, they are wonderful 'gap-fillers,'and very much in the book-vein. 'The Boat,' and 'The Letter,' are both excellent, but I think my favourite of the three has to be 'Beyond Hope.' Frodo and Faramir's interaction here perfectly demonstrates what a sensitive understanding of the book-characters she has. You called it 'quite beautiful,' and I can only agree with that sentiment. Thanks for posting the link to WOTM, Mechtild - I hope others will follow it and discover Zazinka's fics. It's a pity there are only those three, but I wholly support your recommendation - anyone who loves book-Frodo will surely relish these. I'm looking forward to seeing the next instalment of your HA screencaps. I had thought I remembered you being a friend of Flourish, but I couldn't be sure, it's been such a long time. She was a wonderful e-correspondent on all things Tolkien for the time that we emailed each other. I had a terrific time writing to her, she was so knowledgeable on Frodo and the books, so humorous, and so clear in her thinking. I knew of her stories from reading the drafts as she produced them. Otherwise I would have completely missed knowing about them. I think "Beyond Hope" is the best, too, although all three are high-quality fic and make a great trio. That was me - Blossom. There is a sense of betrayal but also foreboding in Frodo's look as he observes Faramir watching it all from above, Faramir’s smile almost a smirk. Frodo seems already to know he has made a bad bargain. 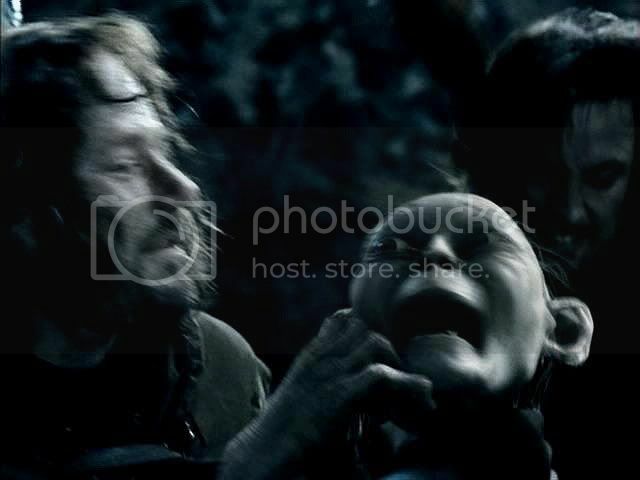 Not only has he betrayed Gollum into the hands of an enemy, he senses he may have betrayed himself as well. Thank you so much, Mechling, for giving us your precious time with these engrossing essays and screen caps. 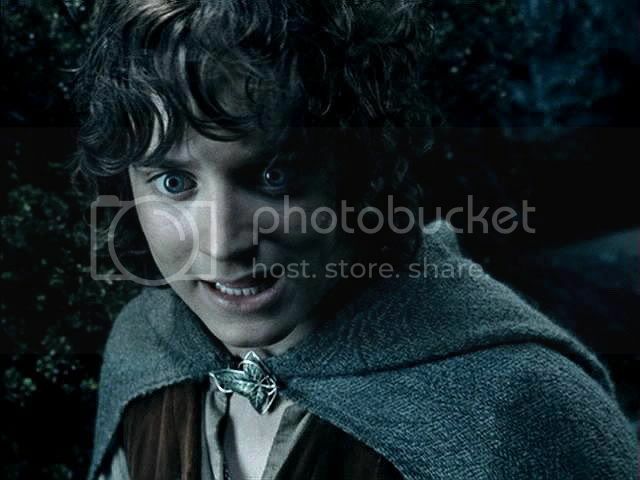 If I could I would arrange for Frodo to call you his Mechling. Awwwww..... You are such a DOLL, Estë. Yes, EW did a great job in the Ithilien-Henneth Annun-Osgiliath sequence, as mixed as my feelings are about them as adaptations of Tolkien. The only exception is the scene I will present next, but he's actually not in the worst part of that scene.